Whether you own a freshwater or saltwater aquarium, maintenance is required to keep the water clean and clear. Saltwater aquariums need more work, though, and more consistent efforts. Clear water doesn't just look good, it's one sign your fish live in a healthy environment. While it may be tempting to purchase water clarifiers, they only treat the symptoms and don't address the cause of your cloudy, murky or dirty tank water. Overfeeding pet fish leads to cloudy tank water. Uneaten food dirties the substrate, floats around and breaks up in the water and slows or clogs the tank filters, leading to a less clean environment. Ask your fish supplier for advice about how much and how often you should feed your fish. Most types do fine with a once-daily feeding. Add fish food in a bit at a time and watch your fish eat until you have a good sense of how much to provide at once; when your fish start spitting food out, they've had enough. Use your net to remove leftovers, rather than let them sit in the water. Regular partial water changes promote clean tanks and clear aquarium water. Major changes to the aquatic environment are highly stressful to fish, and even potentially fatal to more sensitive species. For this reason, you can't just get rid of all the old water -- no matter how cloudy it may be -- and replace it with clean water at once. Change 10 percent of the water at a time every two weeks. Have new water standing by at the same temperature as your aquarium water, and mixed to the appropriate gravity if you have a saltwater tank. For safety, turn off any parts and power to the tank. Siphon out about 1/10 of the water and replace it with the new, clean and clear water. Routine maintenance helps keep your tank clean, your water clear and your tank parts functioning at peak performance. Check often to ensure all the filters, lights, heaters, protein skimmers and other tank components are securely plugged in, leak-free and working well. Follow the care guidelines in the instruction manuals for the components. Clean filters, protein skimmers and all their various small parts as recommended. Perform regular water tests to ensure proper pH, saline, ammonia, nitrate, nitrite and carbonate levels. Clean your tank regularly to keep it and its water clean and clear. Use a net daily to remove any debris floating in the water. An algae magnet works well to remove algae accumulation on the tank glass and on internal tank decorations. Use one often to stay on top of buildup. Wipe away visible salt creep every day or two if you have a marine aquarium. Salt creep is the name given to the crusty accumulation left behind when salt water gets on surfaces. 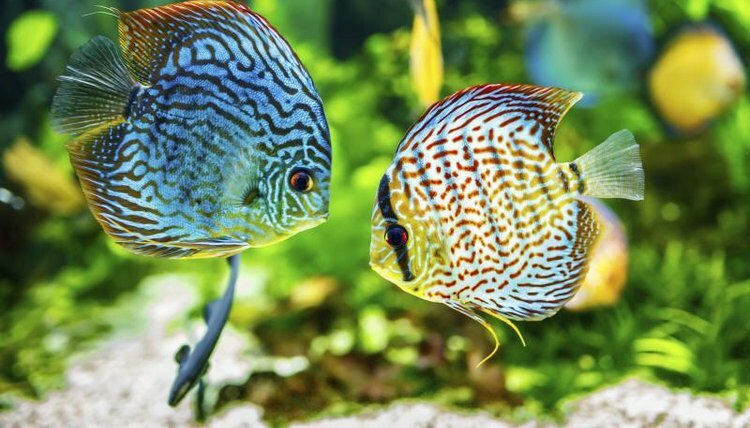 Removing it proactively from glass, filters and other aquarium components prevents it from getting out of hand and significantly dirtying your tank and even inhibiting filter performance and protein skimmer performance. Use glass cleaner on the tank exterior to remove smudges and marks that make your tank water look cloudier.